A few years ago, while lost in the Fez medina, we stumbled across a small family restaurant cooking tagines on coal in the alley in front of their restaurant. We had a good feeling about it and decided to have lunch there. We ordered a couple of tagines and a small salad. Other patrons were all local, and the staff unceremoniously dropped their bread directly on the table for them. For us non-Moroccans, they put our bread on a plate. So many Fez dives are tiny, and lack bathrooms or any place for you (or the people making the food) to wash hands. This place, however, has a nice sink with powdered soap right there in the dining room. The food was delicious and cheap. We enjoyed it and left. Then today, while not lost but passing through a remote corner of the medina, we encountered the restaurant again, and decided on the spot to have lunch. And it's just as delicious as we remember. So I'm now elevating this restaurant to my favorite in Fez. It's cheap and basic, but the fact is that their food is super delicious. I don't know the name of the restaurant, however, because their sign is in Arabic and they don't show up on Google Maps. But we know how to get there now, and I'm sure we'll be back. Maybe we’ll even take our Morocco Experience Gastronomads there. Amira and I had dinner at an undisclosed location here in Morocco — a pretty nice restaurant with some pretty good food. While ordering, our owner/waiter asked if we wanted wine. I said yes. And he said: “We don’t have our liquor license, so if you have wine please be discreet about it.” And so when he brought the wine in a glass, he also brought an empty can of Coke so it looked like I was drinking a soft drink. I looked around the restaurant, and just about everybody had empty cans of various soft drinks on the table. Essaouira in Morocco reminds me of my home town of Carpinteria, California. Carpinteria is famous for its gently sloping beach, which means that you can walk out into the surf 30 yards and still only be waist-deep in water. Essaouira's beach is far bigger, wider and more gradual. You can walk out 100 yards here and only be waist deep. Better still, the water in Essaouira is warmer, and there's no tar to step on. The only two downsides compared with Carpinteria is that in Essaouira you'll encounter trash in the water. That's right. Some enterprising local camel and horse owners will take you on rides on the beach. Riding camels on the beach is actually a must-do activity if you ever make it to Essaouira. You can also rent a quad bike and do donuts in the sand. And Essaouira is notoriously windy, and so it's a kite-surfing paradise. Amira and I like to take long walks on the beach whenever we can. And Essaouira is great for walking. You can walk for miles on the sand. One curiosity along the way, just south of the town is what appears to be a rocky formation on the beach. Upon closer inspection, it looks like a man-made structure completely fused with natural rock. The structure is called Bourj El Baroud, an 18th-century watchtower for a castle built for the Sultan Sidi Mohammed ben Abdallah. That tower was destroyed by a flood in 1856. And it was built on a Phoenician structure. Anyway, it’s great to be on the beach here in Essaouira. It’s just like home — plus ancient ruins and camel pellets. Hunting for a celebrated fish joint in Essaouira, Morocco, we stumbled across this hotel patio and decided to hang out for awhile, get some work done and enjoy a nice Moroccan rosé. Tucked away in the Northeast corner of Italy is one of the most beautiful places on Earth: The stunning vineyard-covered Prosecco Hills of Veneto, just North of Venice. This is the location of our Prosecco Gastronomad Experience. Our Spring trip sold out quickly. So we scheduled another one that takes place June 4 - June 9, 2019. During this magical time, we'll taste some of Italy's best wine and best prosecco. We'll make and taste cheese. Really learn to make pasta. Dine at Veneto's best restaurants. Picnic in stunning vineyards. Enjoy magical gatherings filled with music, fun, food and friendship. And many secret surprises. If you love food and travel, but don't want to travel alone or on a "tour," then join us on this unique experience. Our tiny group of six people will stay together in a beautiful farmhouse perched on a breathtaking hill overlooking an amazing valley of green. From there, we'll discover the exquisite hidden spots along the Prosecco Road that only the locals know about. This adventure will sell out quickly, so send email to mike@elgan.com right away for more information and to grab your spot. After two fantastic days in Spain's cava wine country planning for The Cava Barcelona Gastronomad Experience, our friends Florian and Veronica made us lunch, which included a delightfully mild, oddly grey-colored pasta. Or so I thought. It was a wonderful outdoor lunch, and we had a great conversation and very good food and wine, which included local cava and a nice red wine from a very cool winery nearby. Amira and our hosts talked about the "pasta" in Spanish, and I was kind of spacing out and not really paying attention -- something about seafood, I gathered. The flavor was very mild, boosted by some garlic and chilis. I had seconds. Then thirds. Later, in the taxi to the Barcelona airport, Amira mentioned to me that the "pasta" was in fact a Spanish delicacy called angulas, which are baby eels -- a traditional and monstrously expensive Basque dish (some $200 per pound). Their lifecycle is the opposite of salmon, which live in the oceans but swim up freshwater streams to spawn. Angulas live in European freshwater streams, but swim out to the Atlantic to spawn in the Sargasso Sea. Upon their return to the Atlantic coast of Spain, fisherman scoop them up with nets. We’re hard at work planning our upcoming Cava Barcelona Gastronomad Experience! It looks like a lot of fun, but in fact it’s really a lot of fun. The planning is an act of joy, because of the beautiful, brilliant people we get to be with. And it’s an act of love, because we love the culture of Catalonia. We’re meeting with old friends and new, and Amira is working with our food visionary friends to hand-craft magical gatherings and delicious experiences. We’re tasting everything, scouting locations and planning the deepest, most authentic and most life-changing exploration of Catalonia’s mind-blowing food and wine culture. 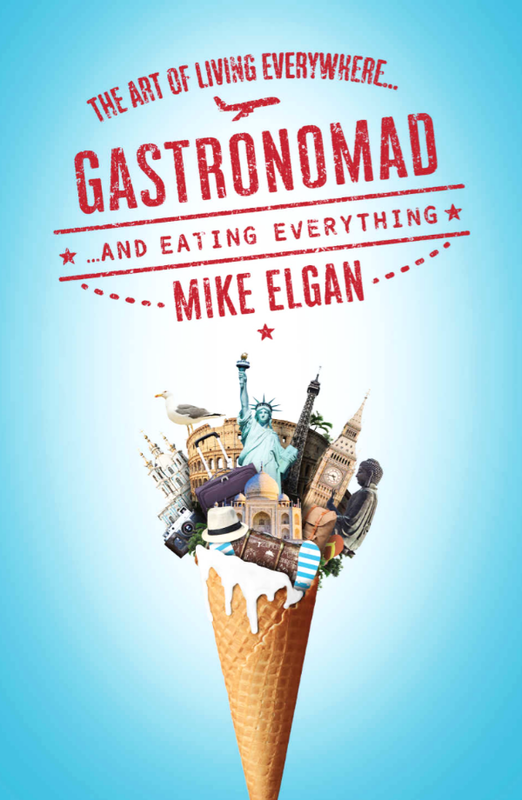 During this adventure, our small gang of gastronomads will learn how to cook, drink and party Catalonian style. We’ll explore the amazing foodie city of Barcelona with the both deep traditionalists and new-school innovators who make Barcelona’s food scene unlike any other in the world. I mean Mexico City. Amira and I are returning in a couple of weeks to resume our exploration of the world's most perfect food. Tacos are perfect because they're endlessly various, and almost always delicious. We've eaten a great many tacos. We've paid 20 cents for a taco; we've paid $20. And everything in between. Later this month during our Mexico City Gastronomad Experience, we’ll introduce some cool people to the best tacos we’ve ever encountered. We’ll learn to make tacos from scratch from one of Mexico’s most famous chefs. We’ll have tacos at the best restaurant in Latin America — and some killer street tacos. We know a couple of newish spots that are doing some very innovative and delicious things with tacos. Did I mention we’re going to have tacos? Can’t wait! Mexico City is one of the greatest food cities in the world. And there's no better way for a food lover to experience Mexico City than our exclusive Mexico City Gastronomad Experience: March 26 through March 31 -- five days and five nights of exploration of the best food and drinks Mexico City has to offer. We have space left for only one more couple! Click here if you're thinking about join us! * We'll pick you up at the airport on March 26 and drop you off on March 31. * Professional-quality, Instagrammable photos of everything you do means you can enjoy yourself and not worry about taking pictures. * And an many delightful and secret surprises! Mexico is where some of the world's greatest foods originate -- chocolate, vanilla, corn, avocados, tomatoes, chili peppers and so many others. And while these popular foods have gone global, the most creative and delicious uses of them still happen in their nation of origin. Mexico is gastronomad heaven, and in Mexico City all that delicious food culture is concentrated and perfected. During the Mexico City Experience, you'll learn everything about all these foods -- learn to cook with and make them -- as well as taste and explore Mexican wine, mezcal and tequila, chocolate, chilis and so much more. You'll learn to bake and cook truly authentic, profoundly delicious Mexican foods. And you'll experience the best restaurants in the city -- and the best street food. Everything we experience will be the best in the city -- every bite you take, everything you drink will be the best of its kind the city, the country and the world has to offer; everything you do will be exclusive to our group. Send me an email here if you'd like to join us -- or even if you're thinking about it! We love Morocco, and spend a lot of time there. And we hear a lot about Moroccan wine, and the strained relationship Moroccans have with it. Morocco is culturally, historically and gastronomically linked to not only Arab and Berber peoples, but also the wine-drinking Spanish and French. The tension stems from the Islamic ban on alcohol, plus the fact that during Morocco's colonial period, the French controlled about 90% of the country and many people moved from France and planted vineyards. And tourism. The essential conflict is between Islamic clergy, which apply pressure to stores and the government to completely ban all alcohol, and the economic health of the country -- alcohol is heavily taxed, and it's availability helps attract millions of tourists to the country, a huge source of foreign revenue. Morocco is a tourist destination. More than 12 million visitors come to the country each year. And most of them are from wine-drinking, non-Muslim countries. They come on holiday, and want to drink wine. Geographically, Morocco is fantastic for growing wine grapes, a practiced probably introduced to the country by the Phoenicians and carried on by the Romans. And so the country produces a significant quantity of wine, and the quality has been improving since the 1990s with fresh infusions of French winemakers attracted by great climate and cheap land. Moroccan culture seems to me to be a shame- rather than a guilt-based culture -- which is to say that many of the trappings of Islamic piety are for show, for the avoidance of social stigmatization, more than displays of deep conviction. So while it's extremely rare to see Moroccans ever drinking alcohol, we’re told that "all" Moroccans do drink it in private and hide it, often from their own families. Moroccans drink alcohol secretly. The alcohol they drink tends to be wine. Many drink wine for the alcohol more than as something to accompany food. We’ve been told Moroccans tend to be indifferent to quality. It's technically illegal for Moroccans to buy alcohol. But sellers are eager to sell to Moroccans, as long as they don't get caught doing it. Foreign visitors are allowed to buy it, and you can typically find wine in hotels, restaurants and supermarkets. The supermarkets keep all the alcohol in a special and separate area. The country of Morocco produces a lot of very bad very wine, some good wine and a small amount of truly great wine. Moroccans generally drink the bad wine and the tourists and export markets drink the good and great. And while wine is available at wineries, hotels, some better restaurants and at specialty liquor stores, the culture around wine is conspicuously undeveloped. Amira and I once ordered a bottle of Moroccan wine during Ramadan (when I believe Moroccans mostly stop drinking wine, even secretly). It was a bottle of red from Morocco's wine country around Meknes. The waiter placed the bottle in an ice bucket with no ice. He had a vague idea that wine goes in one of those buckets, but didn't really understand why. At another restaurant in Fez, we wanted to try a bottle of wine, but were told they sold wine only by the glass. The "glass" for this glass of wine was a weird thick water glass, and not at all suitable for wine. We took a flight once from Fez to Marrakesh -- a domestic flight within Morocco. Amira spotted an interesting bottle of wine in a shop in the airport. When she tried to buy it, she was informed that it was forbidden to sell wine to anyone traveling domestically (even though wine is available in Marrakesh). Leaving Morocco once, we had a few bottles of wine to take back to California. Airport security in Fez runs luggage through an X-ray machine as you enter the airport building. They saw the wine on the X-ray screen. They didn't know what to do. Telling us vaguely that it was "forbidden" to have several bottles of wine, they phoned a supervisor. We waited there for 20 minutes or so before being allowed to enter the airport with our bags. Making wine in Morocco can be a challenge because of the heat. Digging a cellar in the grape-growing areas and storing or making wine there won't give you the temperatures needed for vinification, fermentation and aging. So Moroccan wineries use air conditioners and, in at least one winery we saw, foam insulation glued to the tanks. Moroccan wineries don't make sparkling wine, with one exception that I'm aware of (a 100% chardonnay that was pretty awful). Only one winery in Morocco makes a sparkling wine, for which they use the champagne method. It’s a unfortunately not drinkable. French grape varieties predominate, although some wineries are using some obscure grapes from elsewhere. Mostly we've found Carignan, Cinsaut, Alicante, Grenache, Cabernet Sauvignon, Merlot and Syrah. Moroccan wineries are also unusual because most eschew tasting rooms. They simply don't allow people to come and taste their wine. A tiny number do allow it, but they tend to charge a fortune for the privilege. And the tastings are not really conducted as you’d expect. 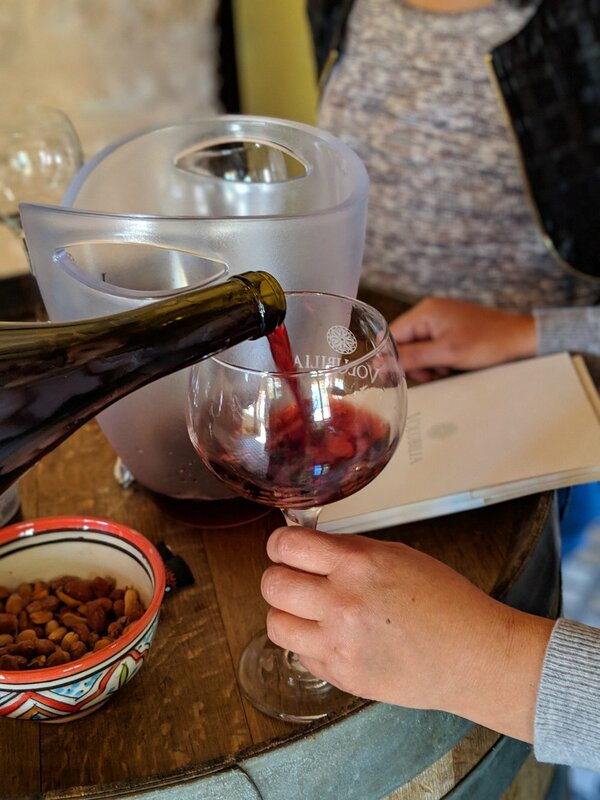 Not much information is provided on the wine or the production unless you’re lucky enough to be received by the winemaker, which never really happens for the general public. Fortunately, if you’re part of our Morocco Gastronomad Experience we’ve got you covered! You’ll get to visit all of Morocco's very best wineries, and taste of all the country's best wines. 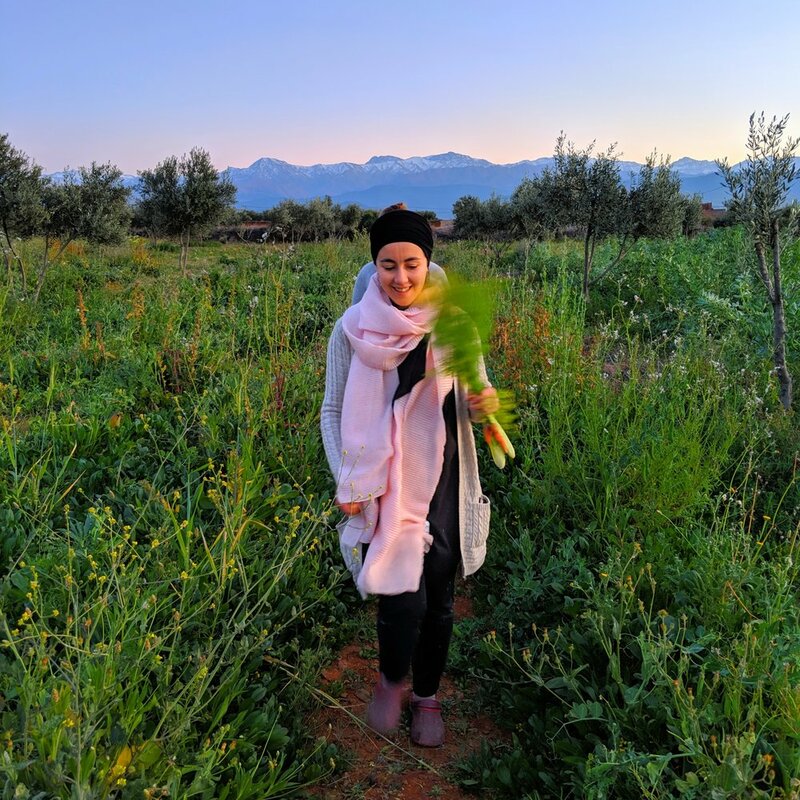 Visiting our wonderful and dear friends Omar and Kenza, the dynamic duo behind Marrakesh Organics, we enjoyed a magical stay on their organic permaculture farm. Returning to their home, which is a Moroccan oasis just outside the hustle and bustle of Marrakech, was even more wonderful than we had imagined. Omar and Kenza are extraordinary people with fascinating upbringings and life stories. They’re true humanitarians and stewards of the land in Morocco. They’re devoting their lives to educating others on how to grow their own food and develop sustainable farming practices as well as preserve the art of ancient building skills. And they’re true kindred spirits — they love and care about much of what we love and care about. In the end, no matter what country we’re from, we all want the same things in life and we’re more alike than different. During our visit, we had the pleasure of meeting two of Omar’s and Kenza’s friends with whom we got to share a couple of meals. One was a permaculture expert who spends a lot of time in India heading an organization devoted to helping farmers develop sustainable farming practices, especially women farmers. The other friend is working on his PhD and doing interesting research on ancient cultivation practices around sustainable farming. The six of us talked for hours as we shared a delicious dinner prepared by Kenza. We had fascinating discussions about many topics revolving around travel, food, nutrition and farming. It was our nirvana. During our last meal at the farm with Omar and Kenza, the four of us got into a profound conversation about living meaningful lives with a sense of purpose, fulfillment and belonging. We even talked about what we all might do someday when we "retire." They said they might travel like us; we said we might farm like them. We actually like the idea of establishing a permanent home, growing food, building a nest with a kitchen full of wonderful cooking stuff and a pantry full of grains, beans, nuts and seeds as we listen to our sauerkraut gurgling next to our sourdough starter. We've encountered a hundred places that would be ideal for permanent living. There's just one problem: To embrace any one place is to give up every other place. And that we don't want to do. Our love for travel is stronger and far more powerful than anything else. Of course, it would be nice have it all. Yes, we lived "residentially" in Sonoma country for two years -- one year surrounded by vineyards and olive groves and the other at an organic farm. We still crave gardening and homesteading. But we also feel deeply compelled to keep moving, exploring and discovering. Life is about living today. Yes, plan for tomorrow but live your best life today. The past is a memory; the future mere anticipation. The present moment is all we have and all we’ll ever have. Life is too short to not live each day to the fullest. And for us, living to the fullest means to keep doing what we’re doing, which means to travel and explore other cultures and keep meeting awesome people like Omar and Kenza. For now, our motto continues to be: The world is too big to stay in one place. It’s a conviction driven by our desire to belong everywhere and settle nowhere. Perhaps it’s because nothing makes us happier or brings us more joy than freely exploring this beautiful planet. Or maybe it’s because our lifestyle during these past 13 years has not only been a dream come true but also because it’s been deeply fulfilling and rewarding giving us a sense belonging everywhere we happen to be. We're in Morocco now. We feel at home here, too. This country is mesmerizing. We're constantly encountering artisans whose skills come down to them from many generations -- maybe a thousand years back. They handcraft their goods with the same tools and in the same way their ancestors did. To witness these crafts in Morocco's ancient medinas is like traveling through time. What a joy to take farm-grown, home-made, traditional meals with such wonderful people we're so lucky to call friends. Our palates rejoice in the intricate flavors and deliciousness of beautiful traditional lamb and barley couscous Kenza prepared -- part of their Friday tradition. We enjoyed this meal out of a communal bowl on their beautiful terrace overlooking their hundreds of olive trees while enjoying the sounds of birds singing all around us. Saying goodbye is always hard. And talking about it made Kenza and me shed a few tears. And for me, those tears and that tender moment together is the greatest gift of love and friendship and something I cherish with all my heart, even when we’re thousands of miles apart and oceans away. Experiencing traditional culture lovingly and skillfully prepared on a farm bursting with life in the embrace of such beautiful people nourishes our souls and fills us with profound gratitude and boundless joy. Amira and I are wine tasting on this rare rainy day in Western Morocco, somewhat near the seaside town of Essaouira. We've got the winery's dining room to ourselves, and (thanks to Google Fi) we have pretty good internet service. The wine is good, especially their rose. I love my life. Moroccan bread is kind of amazing. In a country with wide regional diversity in many things, the bread remains consistent throughout the country. It’s a basically flat, white, small loaf coated with bran. You can buy this stuff everywhere in the country. And it’s cheap. Amira and I just bought two breads and a big slab of butter and it all cost about a dollar. The quality ranges from “not that great” to “pretty damned good” and never higher or lower. But this bread is perfect for scooping up tagines without need for utensils. Amira and I had a fantastic chicken tagine today with really great bread at some dive that probably sells them for $3 each, but we were charged $10 because we were foreigners. Fridays here are a kind of anti-bread day. The devout spend more time at the mosque, and Fridays are an especially religious day. There’s too much religion for bread baking, so bread is harder to find on Fridays. As a result, many people have couscous every Friday, a starchy dish that you don’t eat with bread. Morocco is a primarily Muslim country, and I suspect that most Moroccans don’t drink wine. Ever. However, Morocco was also a French colony, and, ergo: a significant wine industry exists in Morocco. Amira and I haven’t had any wine for two weeks while in Mocorro. We’ve been living deep inside the Medinas in Fez, Marrakesh and elsewhere, where wine simply isn’t sold. But today we arrived in Essaouira, where the wine culture is more prominent. Tomorrow, we’re going wine tasting locally. And later, we’re going to check out the Napa Valley of Morocco, called Meknes. Oddly, the Morocco wine scene reminds me of the Mexican wine scene. A wine industry is struggling to emerge in a country of non-wine drinkers. The domestic market is brutal for them, and the export market is even worse. Still, they persist. We’re on a quest to find Morocco’s best wines, and we’ll report back when we find some excellent ones. Stay tuned! The Bliss Riad, run and co-owned by our friend Sheila, is a wonderful oasis from the chaos of Marrakesh. It’s got comfortable little nooks for hanging out. My favorite of these is called the “Relax & Chill” room. I’m not into relaxing, and I’m not very chill, but I love a great spot to work, and this is the best place to work in all of Morocco. Come join us in Morocco! Moroccan olives are my favorite olives in the world. When we travel to Morocco, I gobble them down. And even when we're in France, I seek out the Moroccan olive sellers in Orange or Marseille -- those spicy Moroccan olives go so incredibly well with French bread and cheese. The first thing you notice about Morocco when you fly into the country is that olive trees are everywhere. The ubiquity of olive trees reminds me of Greece. But unlike Greece, Moroccan olives are more likely destined for eating, not olive oil. Moroccan olives seem to come in infinite varieties. Green, red and black olives are each transformed into different kinds based on curing method and the addition of herbs and spices. And they're often used an an ingredient in cooking, such as tagines. The truth is that my favorite kind of olive is a very common one: Moroccan green cracked spiced olives, which have their pits still in them, and flavored with spicy peppers, garlic, coriander, cumin, lemon juice and olive oil. They're super spicy and flavorful, and I just love them with bread and cheese. The colors of Morocco. The burnt-orange sand of the Sahara. The blue village of Chefchaouen. The deep green rivers of date palms. And the riot of colors in Moroccan spices. These colors thrill your eyes with their surreal and exotic beauty. To travel Morocco is to travel through time. The enormous market of Marrakesh brings you to the middle ages. Entering the ancient Medina of Fez transports you to the 9th Century. And to gaze at the night sky from the top of an Erg Chebbi sand dune is to see light with the naked eye light that has travelled across the universe for a billion years. And the food! Morocco once served as a gathering point for spices originating throughout the East. Arabic, Berber, Spanish and French influences flavor the cuisine. Morocco is the land of tagine, couscous, bastilla, olives, preserved lemon and ras el hanout, the 27-spice mixture that flavors everything from lamb to fish. It’s also the land of wine. The wine country of Meknes is a gift left behind by French colonial rule. Our Gastronomad Morocco Experience is two weeks of exploration of the amazing food of Morocco April 29 through May 12, 2019. Everyone should experience Morocco at least once in their lifetimes. And our Morocco Experience is the most joyful, authentic and delicious way to do it. Click here to join us in Morocco for a magical, unforgettable experience of a lifetime. I love making Adjarian khachapuri! Amira and I lived in Tbilisi, Georgia, about a year and a half ago, where we discovered a world of delicious foods we had never even heard of. One of my favorite Georgian standards is something called Adjarian khachapuri. Basically, it's a boat made out of bread filled with melted cheese and an egg, with butter on top. Khachapuri comes in many types, shapes and sizes. What they all have in common is the combination of cheese and bread, or beef and bread. Some kinds of khachapuri are round, and look just like pizza. In fact, it's probably very close to the pizza Italians used to eat before tomatoes were brought from the New World in the 16th Century. It may have been introduced to Georgians by Roman soldiers. The Adjarian variety appears to be the most popular kind in Tbilisi, and for good reason: Everybody loves an egg on their baked whatever. And Adjarian khachapuri has an egg. Khachapuri is a finger food -- you eat it with your hands. Basically, each end of the boat has stub of bread. You tear one of these off and mix the cheese, egg and butter mixture, and take a bite. You keep tearing off bread and dipping it and eating it. It’s really fun to eat. The khachapuri in Tbilisi is made with yeast-leavened modern white-flour wheat. I make mine with naturally leavened bread with a little whole grain flour. The traditional Georgian cheese, called khacho (after which khachapuri gets its name), is often simulated outside of Georgia with a mixture of feta and mozzarella, which is what I'm using here. Even more home-made is the fact that we're using eggs produced by one of Kevin's chickens, who just started laying last week.